I realize that it’s anathema to cite a TIGHAR document on this site, but my notes on the Tinian dig are at https://tighar.org/Projects/Earhart/Archives/Tinian/tigharstinian.htm, in case anyone’s interested. Another stellar piece of work with help from Jerry Wilson and Jennings Bunn. Thanks, guys, for your time, effort, and new information. Mike your skepticism is well founded. In order to determine if Naftel’s story had legs, I looked into the background of Hawaiian Nisei who returned to Japan prior to the war. Thousands of disillusioned Japanese returned to the homeland from Hawaii and the U.S. mainland during the 1920’s and 30’s. Naturally, many men of draft bearing age were conscripted or drafted into the Japanese military. These English speaking recruits were sought after and highly prized for their dual language skills. I can’t imagine a situation where these men would have been considered “slaves” as Naftel describes his conversation with the unknown Japanese/Hawaiian. I also reached out to several professors at the University of Hawaii familiar with Japanese Hawaiian history. None recalled the Japanese government enticing local Hawaiian boys to work in the sugar cane fields in the Marianas nor were there any advertisements in the Honolulu newspapers offering work in Saipan and Tinian. With that said, it’s not within the realm of possibility that a few young men returning to Japan in the 1930’s then decided to make a better life for themselves in the Marianas – but slave labor, no way. Japanese – first class citizens, Okinawans – second class citizens, Chamorros and Carolinians – third class citizens. A Japanese Hawaiian would not have been classified as slave labor. As far as a native Hawaiian relocating to Tinian in the 1930’s – Marine G- 2 reports listed all those captured after the invasion. There is no record of a “Hawaiian” being taken into custody on Tinian or on Saipan for that matter. I haven’t found evidence of Japanese Army personnel stationed in Saipan in 1937. However, there are unsubstantiated reports that some Japanese Army personnel arrived in Saipan from the China campaign in December 1937. I have found pictures and the presence of Japanese Naval soldiers on Saipan in 1937. The Japanese Naval contingent was based adjacent to the seaplane base at Tanapag. It’s doubtful the Japanese high command would have ordered “slave labor” to bury the bodies of two Caucasians and why on Tinian? There was no military presence on Tinian in 1937. 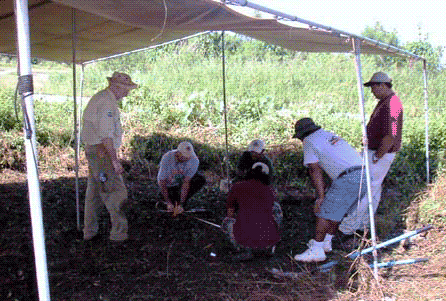 Why would the Japanese take the remains of two Caucasians to Tinian for burial? If, Naftel did here such a story, it wouldn’t have come from a Japanese Hawaiian or Hawaiian working as slave labor on Tinian. Although I haven’t seen such a report, it could have been someone describing the burial of American Aviators shot down over Tinian in 1944. Thanks for your exceptionally well-researched information, which, in my opinion at least, destroys any remaining doubts that Naftel’s tale was legit. 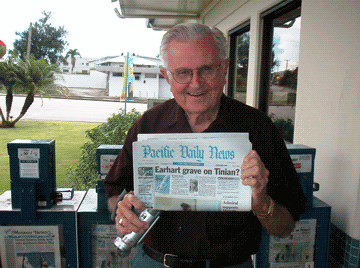 If Jennings Bunn, Jim Sullivan, Bob Silvers and the others involved had known all that you present here, I cannot imagine them going forward with The Tinian Dig in 2004. Here we go again, another grave, but no body. This Hawaiian tells an interesting tale, but can we believe him? Either there was another couple who were imprisoned, tortured and executed and thought to be Amelia & Fred; or this Hawaiian knew something, that the rest of us didn’t. Wouldn’t it have been so much easier, to have told the American public the *truth; than for our government to have fibbed, foiled and fabricated Amelia’s disappearance over the Pacific Ocean? Did they really think, the average American was going to buy this false notion? The tale makes me wonder, if it was a rouse to blind side a an American or the American’s? Les makes an excellent point. The Japanese would have had absolutely no plausible reason whatsoever to transport the bodies of Amelia Earhart and Fred Noonan from Saipan to Tinian for burial there. The idea is ludicrous. That said, a good investigator nonetheless runs out all the leads, starting with the best, most logical and promising ones first. As for the “Hawaiian,” this prisoner could likely have been a very savvy, knowledgeable, English-speaking Japanese who, unsure of his future, cunningly decided to pass himself off as just a poor, unfortunate Hawaiian or ethnic Japanese Hawaiian in hope of better treatment from the Americans. His story sounds like an attempt to ingratiate himself, and perhaps receive better treatment. Good evening folks, wanted to say that to not have checked this account from St. John would have plagued me though the rest of my life. However, I, too, had my doubts as to the graves actually being those of Amelia & Fred. I do firmly believe that St. John did see two graves. I lived on Guam for 14 years, and visited Tinian at least 30 times. So, I am very aware of the transformation we, the U.S. Military, caused on that Island. Had graves existed they highly likely would have been destroyed anyway. So, I will say that to have failed to pursue that possible lead would have been wrong, if for no other reason than to eliminate Tinian as a potential source. I do believe that Mike Campbell is correct in his book, and his belief in the Saipan theory. 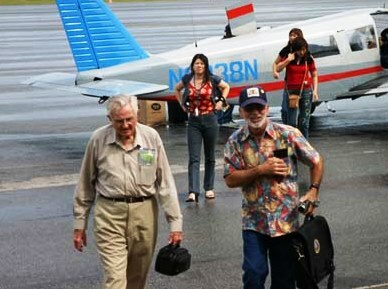 Too much evidence has been recovered, and Americans who were there in 1945, found or witnessed. No better evidence exists, anywhere. So much trickery in those days. It started with the Question Mark.